Invite your family, friends, and colleagues to your event with this eight gold foil invitation cards with envelopes. 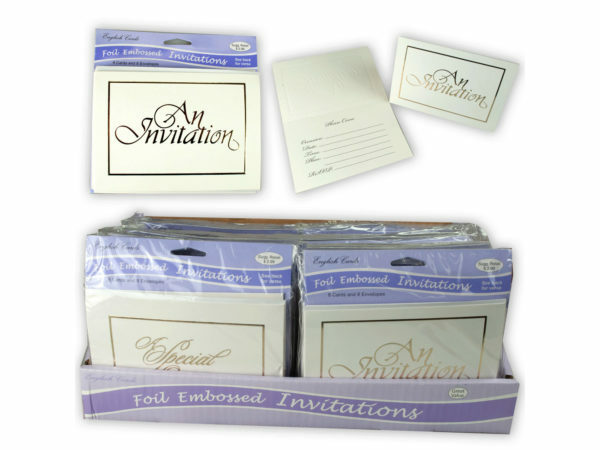 The invitation comes in a standard 4"x 6" card with eight envelopes. Inside the invitation card includes occasion details for you to personalize. It comes packaged in a poly bag and hanging panel. The invitations come in a countertop display that consists of 48 set of 8 invitation cards packaged.